Arturo Toscanini (Italian: [arˈtuːro toskaˈniːni] ; March 25, 1867 – January 16, 1957) was an Italian conductor. He was one of the most acclaimed musicians of the late 19th and of the 20th century, renowned for his intensity, his perfectionism, his ear for orchestral detail and sonority, and his eidetic memory. He was at various times the music director of La Scala in Milan, the Metropolitan Opera in New York, and the New York Philharmonic. Later in his career he was appointed the first music director of the NBC Symphony Orchestra (1937–54), and this led to his becoming a household name (especially in the United States) through his radio and television broadcasts and many recordings of the operatic and symphonic repertoire. 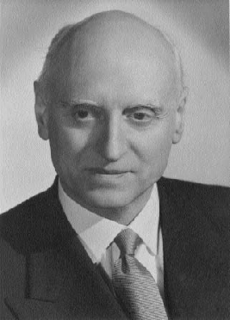 Alfredo Catalani was an Italian operatic composer. 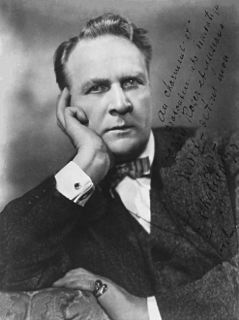 He is best remembered for his operas Loreley (1890) and La Wally (1892). La Wally was composed to a libretto by Luigi Illica, and features Catalani's most famous aria "Ebben? Ne andrò lontana." This aria, sung by American soprano Wilhelmenia Fernandez, was at the heart of Jean-Jacques Beineix’s 1981 cult movie Diva. Catalani's other operas were much less successful. La bohème is an opera in four acts, composed by Giacomo Puccini to an Italian libretto by Luigi Illica and Giuseppe Giacosa, based on Scènes de la vie de bohème by Henri Murger. The world premiere of La bohème was in Turin on 1 February 1896 at the Teatro Regio, conducted by the 28-year-old Arturo Toscanini. Since then, La bohème has become part of the standard Italian opera repertory and is one of the most frequently performed operas worldwide. Ruggero Leoncavallo was an Italian opera composer and librettist. Although he produced numerous operas and other songs throughout his career it is his opera Pagliacci (1892) that remained his lasting contribution, despite attempts to escape the shadow of his greatest success. Toscanini died on January 16, 1957, at the age of 89 at his home in the Riverdale section of the Bronx in New York City. It was his daughter Wally's 57th birthday. His body was returned to Italy and was buried in the Cimitero Monumentale in Milan. His epitaph is taken from one account of his remarks concluding the 1926 premiere of Puccini's unfinished Turandot : "Qui finisce l'opera, perché a questo punto il maestro è morto" ("Here the opera ends, because at this point the maestro died"). During his funeral service, Leyla Gencer sang an aria from Verdi's Requiem . Toscanini made his first recordings in December 1920 with the La Scala Orchestra in the Trinity Church studio of the Victor Talking Machine Company in Camden, New Jersey and his last with the NBC Symphony Orchestra in June 1954 in Carnegie Hall. His entire catalog of commercial recordings was issued by RCA Victor, save for two recordings for Brunswick in 1926 (his first by the electrical process) with the New York Philharmonic and a series of excellent recordings with the BBC Symphony Orchestra from 1937 to 1939 for EMI's His Master's Voice label (which was RCA Victor's European affiliate). Toscanini also conducted the New York Philharmonic in Carnegie Hall for RCA Victor in several recordings in 1929 and 1936. He made a series of long-unissued recordings with the Philadelphia Orchestra for RCA Victor in Philadelphia's Academy of Music in 1941 and 1942. All of Toscanini's commercially issued RCA Victor and HMV recordings have been digitally remastered and released on compact disc. There are also recorded concerts with various European orchestras, especially with La Scala Orchestra and the Philharmonia Orchestra. In 2012, RCA Red Seal released a new 84 CD boxed set reissue of Toscanini's complete RCA Victor recordings and commercially issued HMV recordings with the BBC Symphony Orchestra. In 2013, EMI Classics issued a 6-CD set containing Toscanini's complete HMV recordings with the BBC Symphony. Toscanini's dislike of recording was well-known. He especially despised the acoustic method, and for several years he recorded only sporadically as a result. He was fifty-three years old and had been conducting for thirty-four years when he made his first recordings in 1920 and did not begin regular recording until 1938, after he became conductor of the NBC Symphony Orchestra at the age of seventy. As the recording process improved, so did Toscanini's negative attitude towards making records and he eventually became more interested in preserving his performances for posterity. The majority of Toscanini's recordings were made with the NBC Symphony and cover the bulk of his repertoire. These recordings document the final phase of his 68-year conducting career. Boito, scenes from Mefistofele and Nerone , La Scala, Milan, 1948 – Boito Memorial Concert. Magazine and newspaper reports subsequently detailed legal action taken against Key and the Society, presumably after some of the LPs began to appear in retail stores. Toscanini fans and record collectors were dismayed because, although Toscanini had not approved the release of these performances in every case, many of them were found to be further proof of the greatness of the Maestro's musical talents. One outstanding example of a remarkable performance not approved by the Maestro was his December 1948 NBC broadcast of Dvořák's Symphonic Variations , released on an LP by the Society. (A kinescope of the same performance, from the television simulcast, has been released on VHS and laser disc by RCA/BMG and on DVD by Testament.) 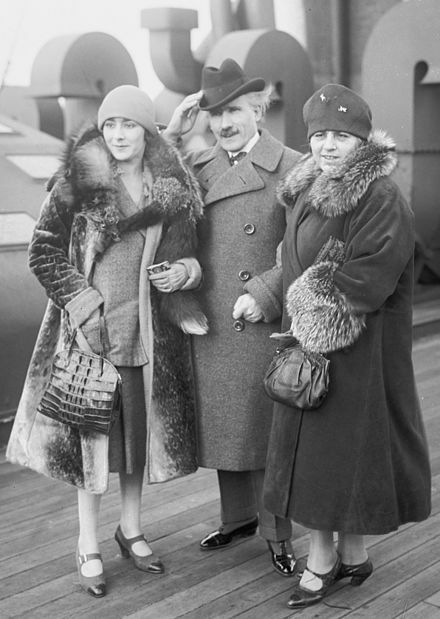 There was speculation that the Toscanini family itself, prodded by his daughter Wanda, had sought to defend the Maestro's original decisions (made mostly during his last years) on what should be released. Walter Toscanini later admitted that his father likely rejected performances that were satisfactory. Whatever the real reasons, the Arturo Toscanini Society was forced to disband and cease releasing any further recordings. There were no Toscanini telecasts in 1950, but they resumed from Carnegie Hall on November 3, 1951, with Weber's overture to Euryanthe and Brahms' Symphony No. 1. On December 29, 1951, there was another all-Wagner program that included the two excerpts from Siegfried and Die Walküre featured on the March 1948 telecast, plus the Prelude to Act II of Lohengrin ; the Prelude and Liebestod from Tristan und Isolde ; and "Siegfried's Death and Funeral Music" from Götterdämmerung . On March 15, 1952, Toscanini conducted the Symphonic Interlude from Franck's Rédemption; Sibelius's En saga ; Debussy's "Nuages" and "Fêtes" from Nocturnes ; and the overture of Rossini's William Tell . The final live Toscanini telecast, on March 22, 1952, included Beethoven's Symphony No. 5, and Respighi's Pines of Rome . Toscanini is the subject of the 1988 fictionalized biography Il giovane Toscanini ( Young Toscanini ), starring C. Thomas Howell and Elizabeth Taylor, and directed by Franco Zeffirelli. It received scathing reviews and was never officially released in the United States. The film is a fictional recounting of the events that led up to Toscanini making his conducting debut in Rio de Janeiro in 1886. Although nearly all of the plot is embellished, the events surrounding the sudden and unexpected conducting debut are based on fact. Beginning in 1963, NBC Radio broadcast a weekly series of programs entitled Toscanini: The Man Behind The Legend, commemorating Toscanini's years with the NBC Symphony Orchestra. 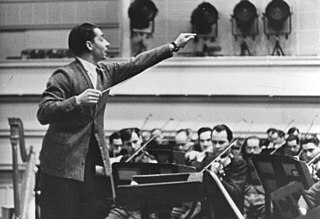 The show, hosted by NBC announcer Ben Grauer, who had also hosted many of the original Toscanini broadcasts, featured interviews with members of the conductor's family, as well as musicians of the NBC Symphony, David Sarnoff, and noted classical musicians who had worked with the conductor, such as Giovanni Martinelli. It spotlighted partial or complete rebroadcasts of many of Toscanini's recordings. The program ran for at least three years, and did not feature any of the revisionist commentary about the conductor one finds so often today in magazines such as American Record Guide. The series was rebroadcast by PBS radio in the late 1970s. Erich Kleiber was an Austrian conductor and a composer. 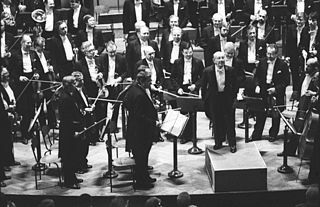 Erich Leinsdorf was an Austrian-born American conductor. He performed and recorded with leading orchestras and opera companies throughout the United States and Europe, earning a reputation for exacting standards as well as an acerbic personality. He also published books and essays on musical matters. The 1947 recording of Verdi's Otello by Arturo Toscanini and the NBC Symphony Orchestra and chorus, is regarded as one of the most notable early Verdi opera recordings. The role of Otello was sung by Ramón Vinay, Desdemona by Herva Nelli, and Iago by Giuseppe Valdengo. ↑ Conati, Marcello; et al. (1986). Encounters with Verdi. Cornell University Press. p. 303. ISBN 0-8014-9430-3. ↑ Greg Daugherty (2 May 2013). "8 Famous People Who Missed the Lusitania". Smithsonian Magazine. ↑ Farrell, Nicholas (2005). Mussolini: a New Life. Sterling Publishing Company, Inc. p. 238. ISBN 1-84212-123-5. ↑ The Double reed. International Double Reed Society. 1995. p. 65. Retrieved 25 July 2012. ↑ Live from Studio 8H: A Tribute to Toscanini. www.imdb.com. Retrieved July 4, 2015. ↑ The Toscanini Legacy collection of sound recordings. archives.nypl.org. Retrieved July 4, 2015. 1 2 Association for the Advancement of Instrumental Music (1993). The Instrumentalist. The Instrumentalist. Retrieved 25 July 2012. ↑ Ewen, David (1949). American composers today: a biographical and critical guide. H.W. Wilson Co. Retrieved 25 July 2012. ↑ A premiere of Wagenaar's Symphony No. 2, 10 November 1932; a Chasins premiere 8 April 1931; and the first performance of Hanson's Symphony No. 2 (the "Romantic") on 1 March 1933 (programs at archives.nyphil.org). ↑ Vinson, Bill; Casey, Ginger Quering. "S.S. Brazil". Welcome Aboard Moore-McCormack Lines. Retrieved 21 May 2013. ↑ MOG.com Archived June 29, 2009, at the Wayback Machine . MOG.com. Retrieved June 7, 2012. ↑ Taubman in 1951 (at page 289) quotes him (without citation) as saying "I asked myself, did I conduct that? Did I work two weeks memorizing that symphony? Impossible! I was stupid!" The violist William Carboni, when interviewed by Haggin in 1967 (at pp. 54–55 of The Toscanini Musicians Knew) quotes him (without citation) as saying "Did I play this? I must have been crazy." Marek in 1975 (at p. 234) quotes him (without citation) as saying "Did I really learn and conduct such junk?" ↑ William Ashbrook (1984). "Turandot and Its Posthumous Prima". Opera Quarterly. 2 (3): 126–132. doi:10.1093/oq/2.3.126. ISSN 0736-0053. Online ISSN 1476-2870. ↑ Frank, Mortimer H. "A Toscanini Odyssey", The Juilliard Journal Online, April 2002. Retrieved February 26, 2008. "That archive was housed at Wave Hill, Toscanini's Riverdale residence during World War II." ↑ Michael Kennedy (May 12, 2002). "Conductor con brio". London: Telegraph. Archived from the original on October 21, 2014. Retrieved October 21, 2014. ↑ Catherine Milner (April 20, 2002). "Letters detail Toscanini's affairs". Telegraph. Archived from the original on October 21, 2014. Retrieved October 21, 2014. ↑ He refused to conduct the section that Alfano composed at the opera's world premiere. ↑ "Toscanini Plays Two New Works." The New York Times, November 6, 1938; first performance of Barber's setting for string orchestra; originally a movement of his Op. 11 string quartet. ↑ Arturo Toscanini: The Complete RCA Collection: Arturo Toscanini: Music. Amazon.com. Retrieved June 7, 2012. ↑ Amazon.com. Amazon.com. Retrieved June 7, 2012. ↑ "Penn Special Collections – Ormandy/Usher". Library.upenn.edu. Retrieved 2012-11-01. 1 2 "The First Televised Orchestra Concert". Library.upenn.edu. Retrieved 2012-11-01. ↑ "Toscanini: Hymn of the Nations". Time magazine, April 29, 1946. ↑ "Toscanini: The Maestro", Amazon.com 2004. Retrieved June 7, 2012. ↑ "Movies: About Il Giovane Toscanini". The New York Times . ↑ Cover story: "Birthday of a Conductor". Time, April 2, 1934. ↑ Cover story: "Toscanini". Time, January 25, 1926. ↑ Scott catalog # 2411. ↑ Toscanini, The Recorded Legend, Classical Notes, Peter Gutmann. Classicalnotes.net. Retrieved June 7, 2012. 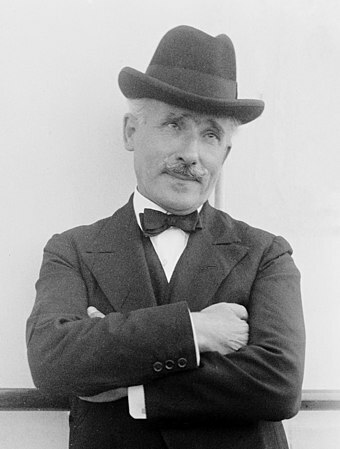 ↑ Explore Toscanini: The Man Behind the Legend: List View UNT Digital Library. Digital.library.unt.edu. Retrieved June 7, 2012. ↑ Klassi.net Archived August 17, 2004, at the Wayback Machine . Klassi.net. Retrieved June 7, 2012. ↑ Gellately, Robert (2018-02-14). The Oxford Illustrated History of the Third Reich. Oxford University Press. ISBN 9780191044021. ↑ Schonberg, Harold C. (1997-01-01). The Lives of the Great Composers. W. W. Norton & Company. ISBN 9780393038576. 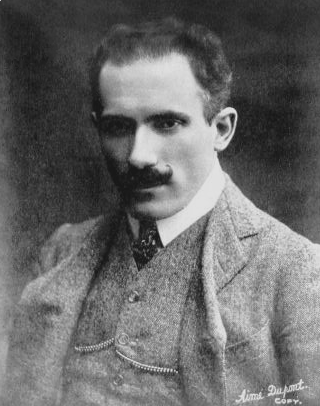 Wikimedia Commons has media related to Arturo Toscanini .